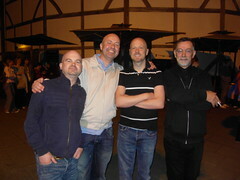 Last Saturday Andy, Kev, Ian, Stu and I went to Shakespeare's Globe on London's glitzy Bankside to see Macbeth. 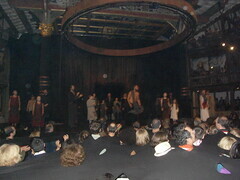 It was a great production bringing the Scottish play vividly to life. Almost too vividly at times. 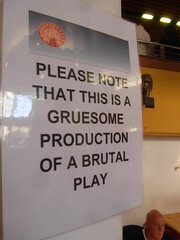 On the way into the auditorium was a sign, "Please note that this is a gruesome production of a brutal play". And they certainly got that right. The front part of The Yard had to put their heads up through holes in a black tarpaulin sheeting that stretched out (five metres?) into the audience. 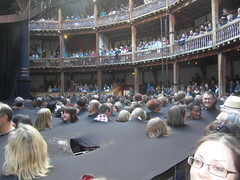 This was partly to extend the stage, partly to great a layer under which performers could move about / pop up with dramatic effect and partly to keep the punters clothes dry from all the piss (water), blood (fake) and flying severed body parts (latex) hurled front of house. The performance itself was good - solidly acted and suitably staged. The famous speeches were all perfectly well delivered, of course, although one issue with the source material is the rather lengthy detailing of the battles. We really enjoyed it though. And for five quid you can't really go wrong. 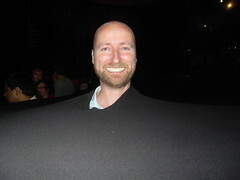 Mind you, standing up for three hours goes take it's toll on the legs.